Does Home Cooking Encourage A Healthy Lifestyle? Teaching your children about a healthy lifestyle early on will reap great benefits in the long run. Being physically active and making smart food choices are two of the main ways to encourage a healthy lifestyle. As a parent, you must be able to teach by example. You can start by taking daily walks and cooking healthy meals with your kids. Sometimes parents become too busy to prepare meals and end up ordering takeout food from a nearby restaurant. While this may sound like a good solution when you’re pressed for time, the food your ordered may not at all be healthy—it may have too much calories or be full of preservatives. Because of this, it’s important to make time for cooking at home, because it puts you in control of your children’s nutrient intake. Children who learn to eat well at home may also be more likely to make smart food choices when they’re away from home, and grow to live healthfully as adults. Cooking meals at home can also get children interested in trying healthy foods they would normally scrunch their faces at, because they’re the ones who cooked—or helped cook—their own food. Learning to cook is also a skill that your children can use for the rest of their lives. By cooking at home, children will also learn that going for takeout is the exception rather than the rule, and that good ol’ home cooking is still best. Your family may be neck-deep in work, school, projects, and other commitments, and may feel like you don’t have enough time and energy to cook at home. Counter this by firmly setting aside a time for cooking healthy meals. With a little planning, your meals can be simple yet delicious and nutritious. 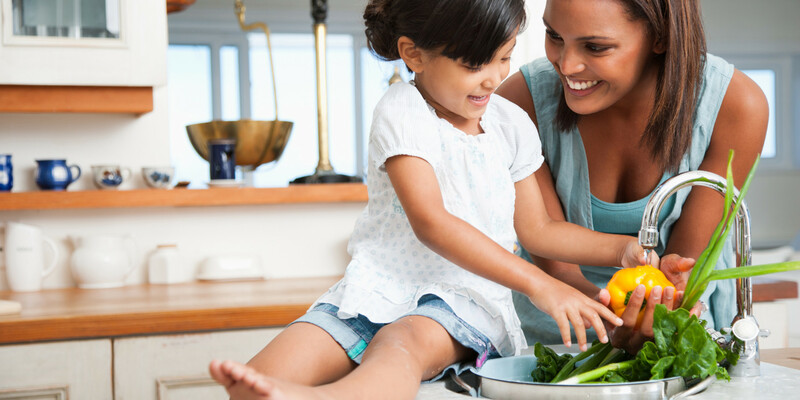 Here are some easy-to-do ideas for your home cooking to encourage a healthy lifestyle for your family. Plan your meals. Choose one day each week when you can plan your family’s meals for the week and make a grocery list based on your meal plan. It’s a good idea to gather your family around for this so you can talk your meals over and even ask them to help you out when it’s time to do the groceries and cook your food. Make meal preparation a family project. Establish teamwork and encourage family members to help out. The youngest children can help you cross out items you already have in your grocery list, while older kids can hone their research skills in looking for healthy recipes online. Plan for leftovers and items for batch cooking too. There may be meals on your list that can be done in one cooking, such as those that have steamed fish or chicken in it. Cook these items one time and keep the rest in air-tight containers in the fridge, so that all you’ll need to do is prepare a new sauce for the next meal. Buy healthy food. Of course, to be able to cook a healthy meal, your kitchen should be well-stocked with healthy ingredients such as chicken breast, brown rice, sundried tomatoes, fresh and frozen vegetables, and whole-wheat pasta. When doing your groceries, stick to your list and avoid buying stuff you don’t need. Say yes to healthy treats. You don’t really have to cook everything from scratch when you prepare snacks or meals for your family. For instance, you can buy some healthy and delicious coconut macaroons for your kids for an after-school Friday treat. There are other healthy options out there—just do a bit of research, be creative, and have fun!